#Health Unimed-Midwest, Inc. Products – Sani-Cloths Wipe Plus, Large, 6″x6-3/4″, 160 Wipes – Sold as 1 EA – Germicidal disposable cloth contains 14.85 percent alcohol. Each wipe cleans, disinfects, and deodorizes hard, nonporous surfaces. Kills RSV, HBV, HIV-1, TB, MRSA, VRE, Staphylococcus Aureus, Salmonella Cholerasuis, Pseudomonas Aeruginosa, Influenza A2/Hong Kong, E. coli, and Herpes Simplex Type 2. EPA-registered meets CDC and OSHA guidelines. Unimed-Midwest, Inc. Products – Sani-Cloths Wipe Plus, Large, 6″x6-3/4″, 160 Wipes – Sold as 1 EA – Germicidal disposable cloth contains 14.85 percent alcohol. Each wipe cleans, disinfects, and deodorizes hard, nonporous surfaces. Kills RSV, HBV, HIV-1, TB, MRSA, VRE, Staphylococcus Aureus, Salmonella Cholerasuis, Pseudomonas Aeruginosa, Influenza A2/Hong Kong, E. coli, and Herpes Simplex Type 2. EPA-registered meets CDC and OSHA guidelines. 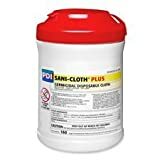 Comments Off on #Health Unimed-Midwest, Inc. Products – Sani-Cloths Wipe Plus, Large, 6″x6-3/4″, 160 Wipes – Sold as 1 EA – Germicidal disposable cloth contains 14.85 percent alcohol. Each wipe cleans, disinfects, and deodorizes hard, nonporous surfaces. Kills RSV, HBV, HIV-1, TB, MRSA, VRE, Staphylococcus Aureus, Salmonella Cholerasuis, Pseudomonas Aeruginosa, Influenza A2/Hong Kong, E. coli, and Herpes Simplex Type 2. EPA-registered meets CDC and OSHA guidelines.